The Jacksonville Jaguars were 2-0 and coming off of their bye week as they hosted the Pittsburgh Steelers on September 22, 1997. 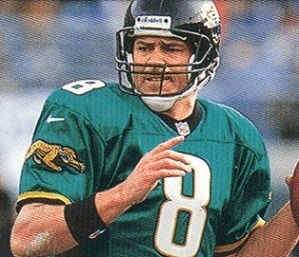 Moreover, Head Coach Tom Coughlin’s team had won those games with two different backup quarterbacks at the helm due to a knee injury suffered by QB Mark Brunell (pictured above), who led the NFL with 4367 passing yards in 1996, and he was now returning to action. Overachievers who went all the way to the AFC title game the previous year, the third-year expansion team had won six straight regular season games dating back to the previous November. Pittsburgh, coached by Bill Cowher, was accustomed to contending. Third-year QB Kordell Stewart was new to the starting lineup but the ground game was led by dependable RB Jerome Bettis and the defense was typically tough. The Steelers split their first two games. There were 73,016 fans in attendance at Alltel Stadium for the Monday night game. The Jaguars had the game’s first possession and drove 68 yards in ten plays. Mark Brunell converted a third-and-10 situation with a pass to WR Keenan McCardell for 15 yards and RB Natrone Means ran for five yards on a third-and-three play. Consecutive throws by Brunell were complete to McCardell for 15 yards and to WR Jimmy Smith for 23 to reach the Pittsburgh three yard line and two plays later Means gained the final yard for a touchdown. Mike Hollis added the extra point. Pittsburgh WR Will Blackwell returned the ensuing kickoff 99 yards, but the play was nullified by a holding penalty. However, the Steelers proceeded with an 80-yard scoring series that took six plays. The biggest was a third down throw by Kordell Stewart to WR Charles Johnson that picked up 49 yards to the Jacksonville 12 and, following a six-yard run by RB Jerome Bettis, Stewart scrambled for a six-yard TD. Norm Johnson’s kick tied the score at 7-7. A short Jacksonville series ended with a punt but the Jaguars got the ball back three plays later when Stewart fumbled when sacked by DE Tony Brackens and LB Eddie Robinson recovered at the Pittsburgh 38. In a possession that stretched into the second quarter, Means ran for nine yards on first down and Brunell completed three passes, the last to Smith for an 11-yard TD. Hollis converted to give the home team a 14-7 lead. The Steelers started off with the ball at their 42 following a 40-yard kickoff return by Blackwell, but after reaching the Jacksonville 39 they were forced to punt. A long series by the Jaguars started off with Brunell being sacked by LB Levon Kirkland for a loss of 11 yards but Brunell threw to Smith for 29 yards and, a few plays later and facing third-and-20, connected with RB James Stewart for 29 yards to the Pittsburgh 43. It appeared that the drive was finally thwarted when Brunell was sacked for a seven-yard loss by DT Oliver Gibson and then threw an incomplete pass when facing third-and-15 at the Pittsbugh 38. But punter Bryan Barker passed instead of kicking and it was complete to DB Dana Hall for a 22-yard gain. However, after getting to the 11, the home team came up empty when Hollis missed a 29-yard field goal attempt. Jacksonville got the ball back two plays later when Stewart’s pass was intercepted by CB Aaron Beasley, who returned it five yards to the Pittsburgh 35 with 1:21 remaining in the first half. Brunell completed four passes and Hollis was successful on a 20-yard field goal to give the Jaguars a 17-7 halftime lead. Jacksonville had thus far dominated time of possession, holding onto the ball for 21 of the game’s first 30 minutes. Down by ten, the Steelers started off the third quarter with a 13-play, 80-yard drive. Bettis (pictured at right) ran for 44 yards on 7 carries, with a long of 16, RB George Jones contributed an 18-yard run, and Stewart completed three passes, the last to WR Yancey Thigpen for a four-yard touchdown. Norm Johnson’s point after narrowed the score to 17-14. The Jaguars, helped along by a pass interference penalty on the Steelers, came back with a series that resulted in Hollis kicking a 45-yard field goal. Another long Blackwell kickoff return that covered 52 yards put the Steelers at the Jacksonville 48 and, on a seven- play drive that featured a 19-yard run by Bettis and a Stewart toss to Charles Johnson for 26 yards, they scored on the first play of the fourth quarter as Stewart connected with TE Mark Bruener for a one-yard TD. Norm Johnson’s extra point put the visitors in front by 21-20. The Jaguars again reached Pittsburgh territory as Brunell passed to Smith for a 41-yard pickup but, after the drive was stopped at the 19, Hollis failed on a 38-yard try for a go-ahead field goal. The Steelers had to punt on their next series and Jacksonville again had a long possession that ran over six minutes off the clock and was helped along by a critical unnecessary roughness penalty on DE Nolan Harrison to nullify a third down sack. Brunell completed six passes, three of them to Smith and the longest to WR Reggie Barlow for 18 yards, and this time Hollis came through with a 27-yard field goal that put the Jaguars back on top by 23-21 with 4:14 remaining to play. Starting from their 40 following Blackwell’s 30-yard kickoff return, the Steelers kept the ball on the ground and also received help with a five-yard penalty on the Jaguars on a fourth-and-one play. Stewart threw to Thigpen for a 21-yard gain to the Jacksonville 25 and Pittsburgh was at the 22 when Norm Johnson came on to attempt a final-play field goal from 40 yards to win the game. However, the snap was low and the holder, QB Mike Tomczak, had difficulty in getting the ball set, placing it at a bad angle. Johnson’s kick was blocked by DE Clyde Simmons and safety Chris Hudson recovered and ran 58 yards for a touchdown. Hollis added the superfluous extra point and the Jaguars not only avoided a last-second defeat but won in stunning fashion by a final score of 30-21. Jacksonville led in total yards (343 to 306), first downs (23 to 19), and time of possession (33:55 to 26:05), although Pittsburgh was much better at controlling the ball in the second half. The Jaguars were stifled on the ground as Pittsburgh outgained them, 153 to 40, but had a big lead in net passing yards (303 to 153). The Steelers turned the ball over twice, to none by Jacksonville. Pittsburgh led in sacks (three to two) but also in penalties (6 for 82 yards, against four for 35 yards against Jacksonville). The teams combined for just three punts (two by Pittsburgh, one for the Jaguars) although both clubs had trouble on field goals, with Mike Hollis missing two from under 40 yards and Norm Johnson’s lone attempt being botched at the end. Mark Brunell completed 24 of 42 passes for 306 yards and a touchdown with none intercepted. Jimmy Smith had a big performance with 10 catches for 164 yards and a TD and Keenan McCardell contributed 6 receptions for 51 yards. Natrone Means rushed for 40 yards on 24 carries that included a score. For the Steelers, Kordell Stewart was successful on 11 of 16 throws for 155 yards and two TDs while giving up an interception, and also ran the ball 7 times for 19 yards and a touchdown. 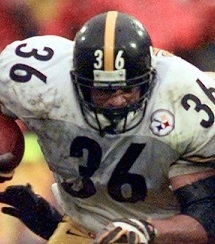 Jerome Bettis, who came on strong in the second half, gained 114 yards on 21 rushing attempts. Yancey Thigpen caught 5 passes for 53 yards and a TD and Charles Johnson gained 88 yards on his four receptions. Will Blackwell averaged 37.8 yards on four kickoff returns. “This was a big win for us because it was on Monday night, it was against the Steelers, and because of the way we won,” said Mark Brunell. Jacksonville lost the following week but was at 5-1 before losing two more, including the rematch with the Steelers. The pattern of a flashy passing game and mediocre ground attack held throughout the season. The Jaguars ended up with an 11-5 record, as did Pittsburgh, and the Steelers won the AFC Central title due to the net division points tiebreaker. Jacksonville was demolished by Denver in the Wild Card playoff round while Pittsburgh reached the AFC Championship before also losing to the Broncos in a closer contest. Mark Brunell went on to lead the AFC in passing with a 91.2 rating as he completed 60.7 percent of his passes for 3281 yards and 18 touchdowns while giving up just seven interceptions. He was selected to a second straight Pro Bowl where he was joined by Jimmy Smith, who accumulated 82 catches for 1324 yards (16.1 avg.) and four TDs.